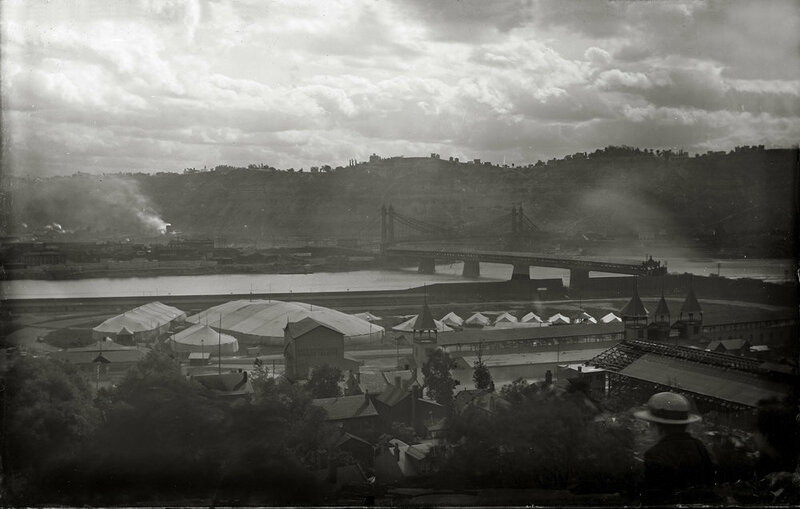 Vintage Photographs of Pittsburgh, it’s history and people. 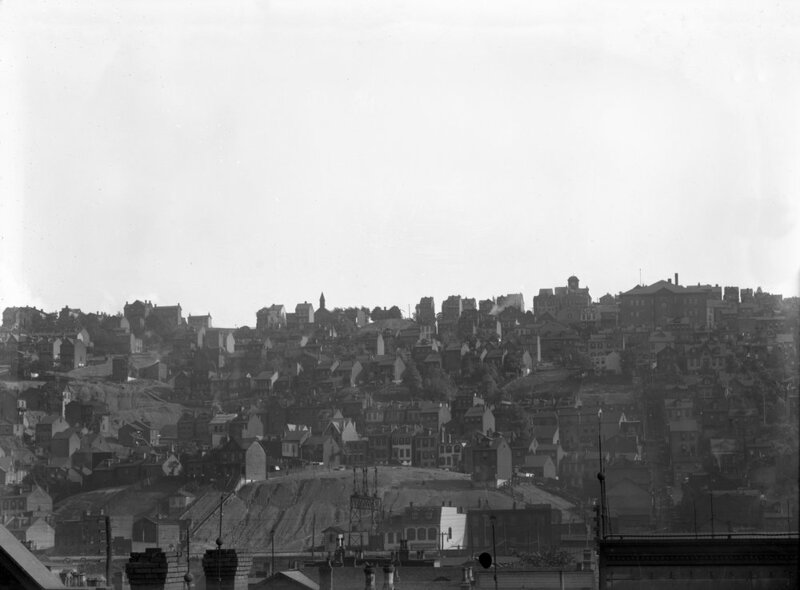 En route to Washington for his inauguration, President-elect William H. Harrison visited the city. 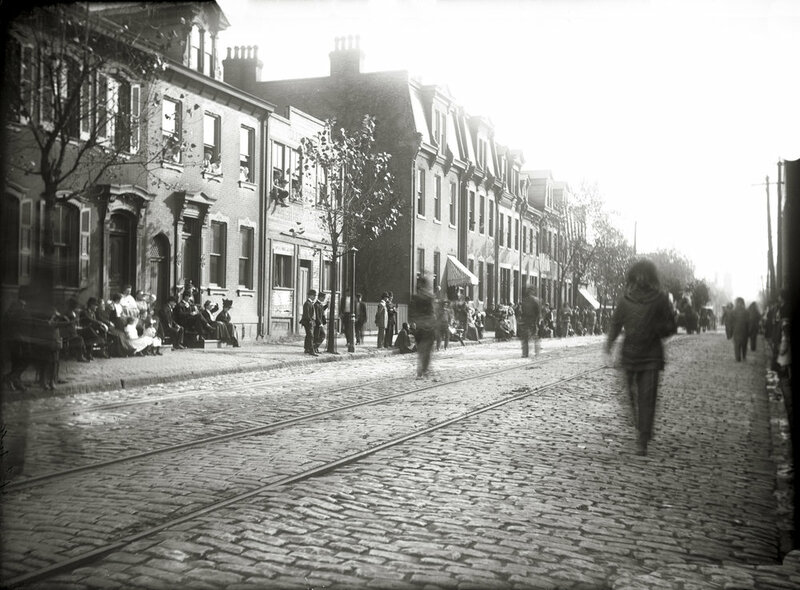 Charles Dickens, the English author, arrived with his wife at the Exchange Hotel, Penn Avenue at Sixth, for a three-day visit. A second cut, this one seven feet, was made in the "Hump." Puddlers and boilers in iron mills began a five-month strike in protest against a reduction in wages; this action led to later organization of the Sons of Vulcan. In the city's greatest musical event of the era, Jenny Lind, under the management of Phineas T. Barnum, sang at Masonic Hall, Fifth Avenue, before 1000 persons who paid an average of $7 each for tickets sold on auction. The Jones and Laughlin Steel Company began as the American Iron Company, founded in 1852 by Bernard Lauth and B. F. Jones, a few milessouth of Pittsburgh along the Monongahela River. James Laughlin, a banker and merchant, built the first two Eliza blast furnaces with beehive coke ovens, on the north side of the Monongahela River, directly opposite the Jones, Lauth plant. The new plant was known as Laughlin and Company. Stephen Collins Foster, Pittsburgh's best-known composer, died destitute in New York. George Westinghouse, at 19, received his first patent for the invention of a rotary steam engine. Jones and Laughlin Eliza Furnace along Pittsburgh's South Side. The monument, dedicated in 1871, honors the Battles of Gettysburg, Vicksburg, Antietam and Appomattox and the four thousand Allegheny County soldiers who died in the Civil War. 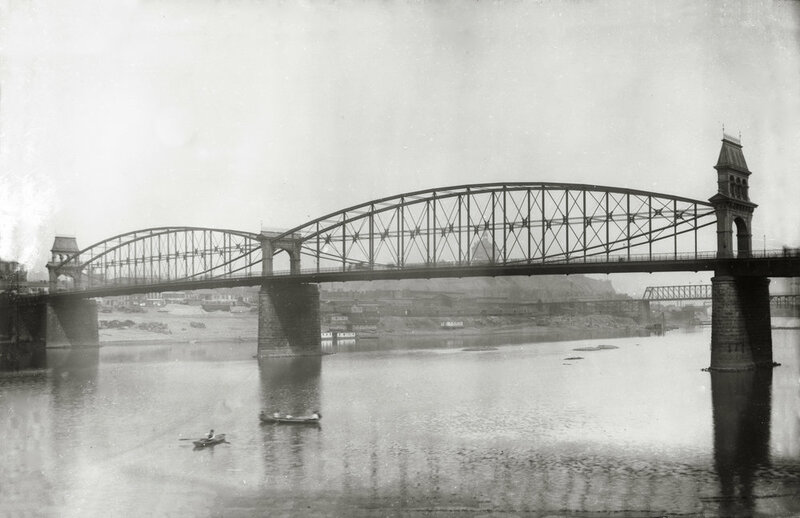 The Point Bridge was opened in April 1877. The light construction of this bridge was, however, in the end a drawback because the company did not maintain it properly. 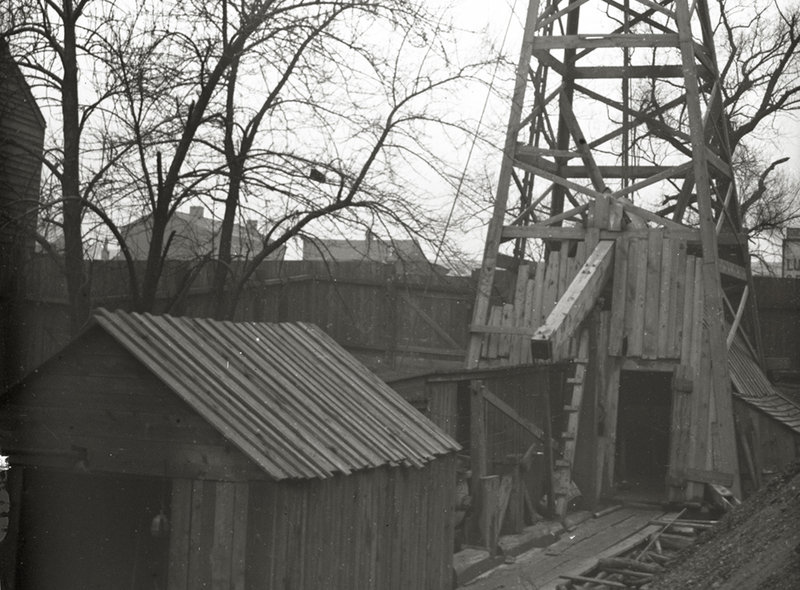 Jones and Laughlin Gas Well, located at 26th Street in the mill yard. First gas well to be drilled in Pittsburgh. Note Limited Lumber Yard sign on adjoining property. Lance's Brick Yard Showing the location of Jones and Laughlin in the 24th Ward. Old 24th Ward Showing Old Bessie Track over which coal was hauled from coal mine to mill in the background St Peters Church in the Center. This class of blooming mill engine is generally used in the Pittsburgh district. 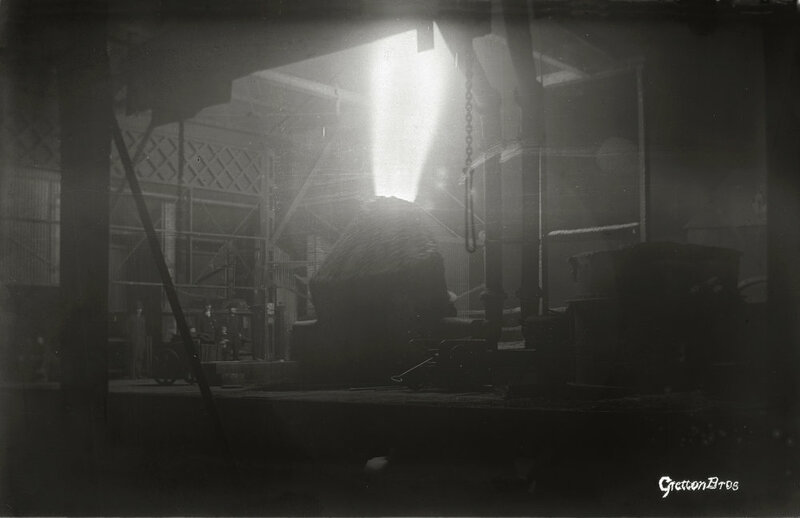 Jones and Laughlin constructed two seven-ton Bessemer converters at the South Side plant for the job of making its first steel. Brownstown from hill above Second Ave. Jones and Laughlin on right of picture. Erecting bridge over the Monongahela River connectingthe Blast Furnace with Mill Jones and Laughlin. Note old style boiler on bridge to the left of center pier, also men working on bridge. Unloading Coal from old wooden barges Elizabeth blast furnace. 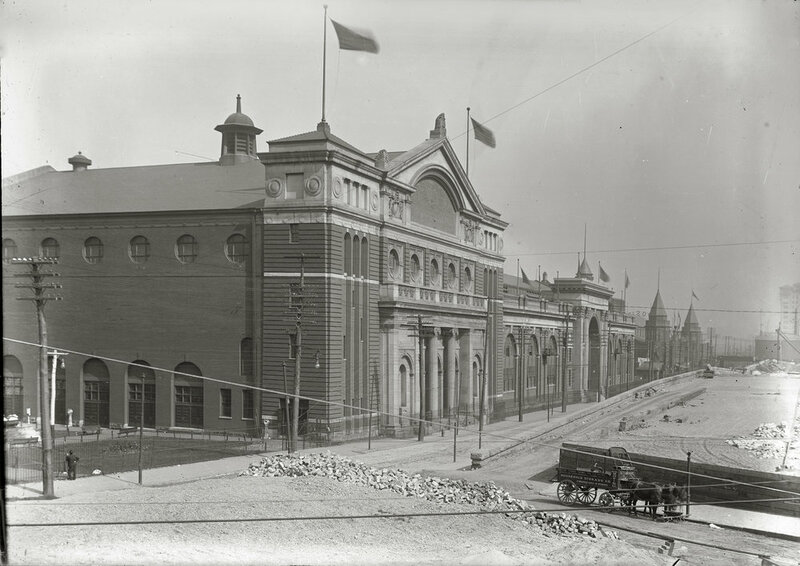 The new Allegheny County courthouse and jail, designed by H. H. Richardson, was dedicated on the final day of the county's centennial anniversary. Pittsburgh Courthouse looking down to the Stock Yards. Allegheny County Courthouse and jail at time of dedication (note the flags flying on the tower). The official dedication of the building was July 4th. Ground was broken for the first Ferris wheel, invented by George Washington Ferris of the city. The city purchased the Point Bridge for $750,000 and the Smithfield Street Bridge for $1,152,583. The Daughters of the American Revolution (DAR) won a legal suit to prevent removal of the historic Blockhouse from its original site at the Point. The historic old Union Bridge, built about 1835 over the Allegheny River at the Point, was closed to traffic, and dismantling of it began. This web site comprises and contains copyright materials. You may not distribute, copy, publish or use the images or any part of the images in any way whatsoever. You may not alter, manipulate, add to or delete an image or any part of an image. Copyright for all the images remains with Photo Antiquities Museum of Photographic History.